New Orleans is the largest city in the U.S. state of Louisiana. New Orleans is located in southeastern Louisiana along the Mississippi River, just south of Lake Pontchartrain, and is coextensive with Orleans Parish. The 2000 census put New Orleans's population at 484,674 and the New Orleans metropolitan area's population at 1,337,726. This is a Southern city known for its multicultural heritage (especially French and Spanish influences) and its music and cuisine. It is a world-famous tourist destination thanks to its many festivals and celebrations; the most notable annual events are Mardi Gras, Jazz Fest, Tennessee Williams Literary Fest, Southern Decadence, and the Sugar Bowl. The city is on the banks of the Mississippi River about 100 miles upriver from the Gulf of Mexico at 30.07°N, 89.93°W. New Orleans is a unique city because some areas of the city range from 1 to 6 feet (0.3 to 1.8 m) below sea level. In addition to the urban areas of the city, New Orleans includes undeveloped wetland, especially in the east. This makes New Orleans very flood-prone, so if it rains more than 1 inch (25 mm) there is usually some form of area flooding. Because of this, nearly all of New Orleans' cemeteries use above ground crypts rather than underground burial. 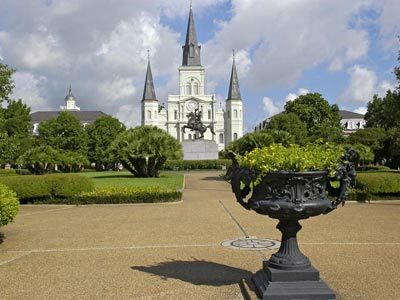 New Orleans was founded in 1718 and has played an important role in the history of the United States. The city was named in the honor of Philippe, duc d'Orléans, who was regent and ruler of France when the city was founded. This is comparable to New York City which was named in the honor of James, Duke of York, heir to the throne of England. New Orleans is a major port city due to its location near the Gulf of Mexico and along the Mississippi River, making it a hub for goods which travel to and from Latin America. The petroleum industry is also of great importance to the New Orleans economy; many oil rigs are located in the Gulf. The Port of South Louisiana (which includes the port of N.O.) is based in the New Orleans metropolitan area and is the 4th largest port, in terms of raw tonnage, in the world. New Orleans is one of the most visited cities in the United States, thus tourism is a major staple in the area's economy. The city's colorful Carnival celebrations during the pre-Lenten season, centered on the French Quarter, draw particularly large crowds. Mardi Gras is a tradition that stretches back for years. During this time, Bourbon street is closed and open only to pedestrians or police. The Sugar Bowl college football bowl game, played in early January, is also major tourist attraction, as well as the New Orleans Jazz & Heritage Festival. New Orleans' Southern Decadence is one of the largest annual Gay/Lesbian celebrations in the nation and world. Hundreds of thousands of participants descend upon the city during the Labor Day weekend, when the festival is traditionally held. Greater New Orleans has many major attractions, from the world-renowned Bourbon Street and the French Quarter's notorious nightlife to St. Charles Avenue, home to Tulane and Loyola Universities; many stately 19th century mansions; and Audubon Park and Audubon Zoo. Favorite tourist scenes in New Orleans include the French Quarter (known locally as "the Quarter"), which dates from the French and Spanish eras and is bounded by the Mississippi River and Rampart Street, Canal Street and Esplanade Ave. A popular visiting spot in the quarter is the French Market (including the Café du Monde, famous for café au lait and beignets). The Natchez, an authentic steamboat with a calliope tours the Mississippi twice daily. New Orleans is well known for its Creole culture and the persistence of Voodoo by a few of its residents, as well as for its music, food, architecture, and good times. New Orleans is usually pronounced by locals "Noo Or-lins", "Naw-lins", or "Noo OR-lee-anns". The distinctive local accent, sometimes identified as Yat, is unlike either Cajun or the stereotypical Southern accent so often misportrayed by film and television actors. It is similar to a New York "Brooklynese" accent to people unfamiliar with it. There are many theories to how the accent came to be, but it likely results from New Orleans' geographic isolation by water, and the fact that many of the immigrant groups who reside in Brooklyn also immigrated to New Orleans (Irish, Italians, and Germans being among the largest groups). Unfortunately, this distinctive accent is dying out generation by generation; it is usually attested much more strongly by older members of the population. Also notable are lexical items specific to the city, such as "lagniappe" (pronounced LAN-yap) meaning "a little something extra," or using terms like "neutral ground" for a median. The City has the nicknames the Crescent City, the Big Easy, the Paris of America, and the City that Care Forgot. The city's unofficial (but commonly touted) motto is "Laissez les bons temps rouler", translated to: "Let the good times roll." New Orleans created its own spin on the old tradition of military brass band funerals; traditional New Orleans funerals with music feature sad music (mostly dirges and hymns) on the way to the cemetery and happy music (hot jazz) on the way back. Such traditional musical funerals still take place when a local musician, a member of a club, krewe, or benevolent society, or a noted dignitary has passed. Until the 1990s most locals preferred to call these "funerals with music", but out of town visitors have long dubbed them "jazz funerals". Younger bands, especially those based in the Treme neighborhood, have embraced the term and now have funerals featuring only jazz music. New Orleans has always been a significant center for music with its intertwined European, Latin American, and African-American cultures. The city engendered jazz with its brass bands. Decades later it was home to a distinctive brand of rhythm and blues that contributed greatly to the growth of rock and roll. In addition, the nearby countryside is the home of Cajun music, Zydeco music, and Delta blues. New Orleans is the home of the New Orleans Saints National Football League team. The city also has an Arena Football League team, the New Orleans VooDoo, owned by the Saints' owner, Tom Benson. The New Orleans Hornets of the National Basketball Association moved to the city starting in the 2002–2003 season; they were previously based in Charlotte, North Carolina. The New Orleans Zephyrs AAA minor league baseball team plays in adjacent Metairie. Historical teams included the New Orleans Pelicans baseball team (1887–1959), the New Orleans Breakers of the United States Football League, the New Orleans Night of the Arena Football League (1991–1992), and the New Orleans Brass ice hockey team (1997–2003). Former basketball teams were the New Orleans Buccaneers (c. 1967–1970), and the New Orleans Jazz (1974–1980) which became the Utah Jazz.